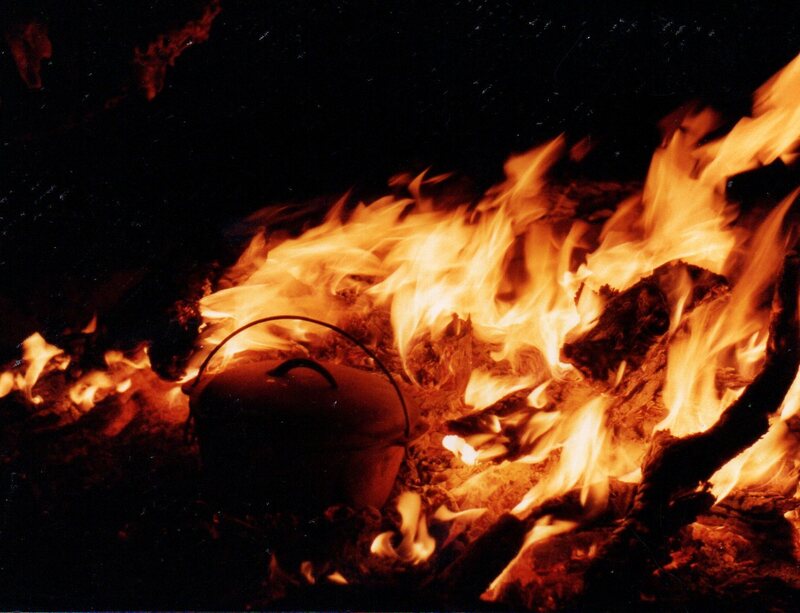 First Camping Trips – Remember when…? I was looking through some old photo albums this week and came across the old west coast camping trip photos. 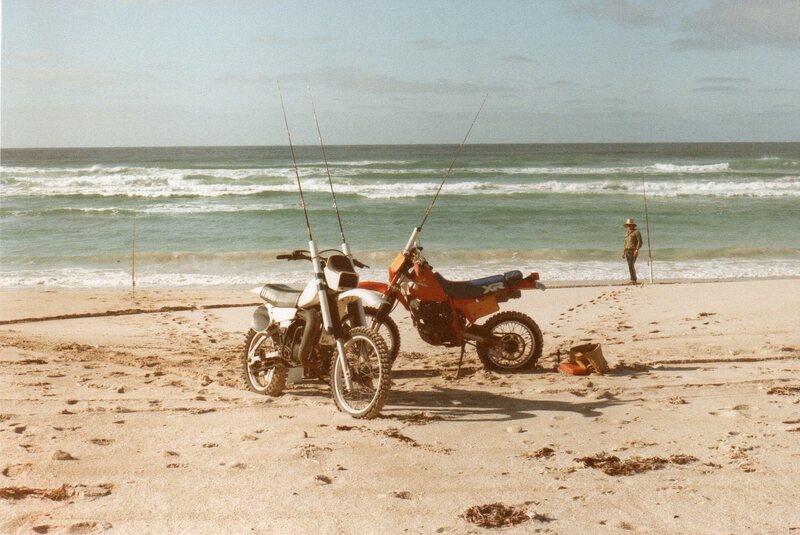 Our very early days of camping / fishing trips saw us venture over 900kms from Adelaide, to the far west coast of South Australia to a place called Scott Bay. Here in a convoy of 3 or 4 cars and a trailer with dirt bikes we would head off into the sunset feeling like explorers. We would spend two weeks camping rough, way before ‘survivor’ was even thought of. Our travelling music of choice when radio stations ran out was cassettes, usually Midnight Oil, Cold Chisel and The Barking Spiders Live. (Look that one up!) We would amuse ourselves over the long drive with silly conversations over CB radios and the odd game of trivial pursuit, again over the CB. Just getting to the camping spot was a little hairy. 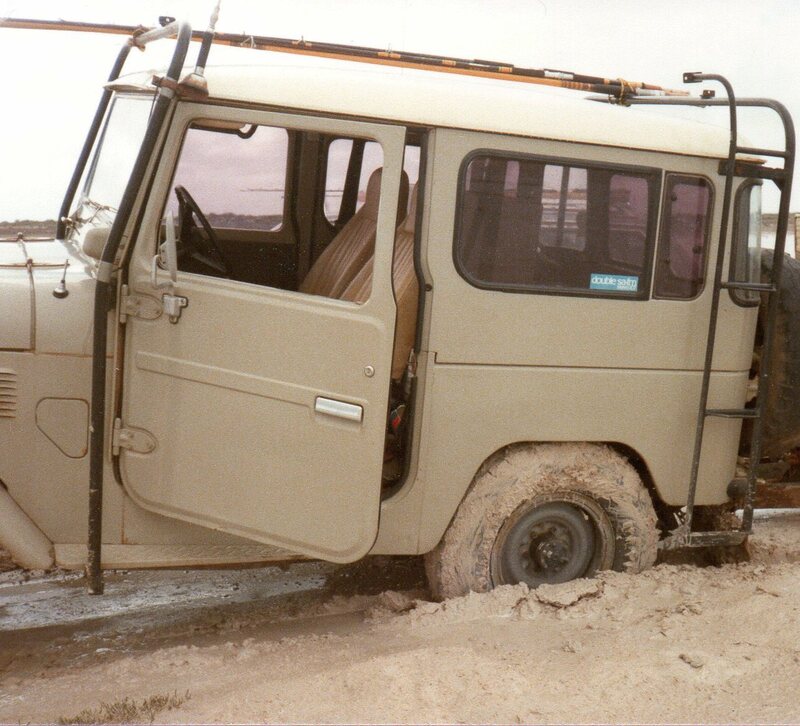 I’ll never forget our first adventure there, we could have taken a track to get to the sand dunes but someone had the brilliant idea of taking a short cut across a salt pan. Great idea until the first car got bogged, then the second that went to get the first! But back then we were all experts and eventually by lightening the load (read: take out the many cases of beer from bogged car) everyone was freed and we took the road ‘more’ travelled to a spot to camp. Back then (mid to late 80’s) it was rare to find any others camping in the same place. It did feel very isolated, camping behind massive sand dunes, riding dirt bikes along the beach, discovering coves, fishing during the day, cooking up the catch at night and telling tall stories and having plenty of laughs around a campfire. Weather conditions could be rather tricky too, these were the days before weather apps etc… so all we could rely on was not terribly accurate radio weather updates from places nowhere near us. We had wind that blew a gale and whipped up sand, the occasional cloudy, stormy and drizzly day, but mostly days of searing heat in the high 30’s. Plenty of sunscreen was slathered on, in fact we probably gained an extra layer of skin especially since there were no showers to speak of either. To get clean it was either try to get a lather with salt water soap in knee deep water in the ocean, (big toothy critters in the waters over there so no-one swam) or drive a couple of kilometres back to Fowlers Bay which at the time had only a jetty and an old rainwater tank that had toilets and cold bore water showers, luxury. But the fishing was fantastic, which was the point of being there. 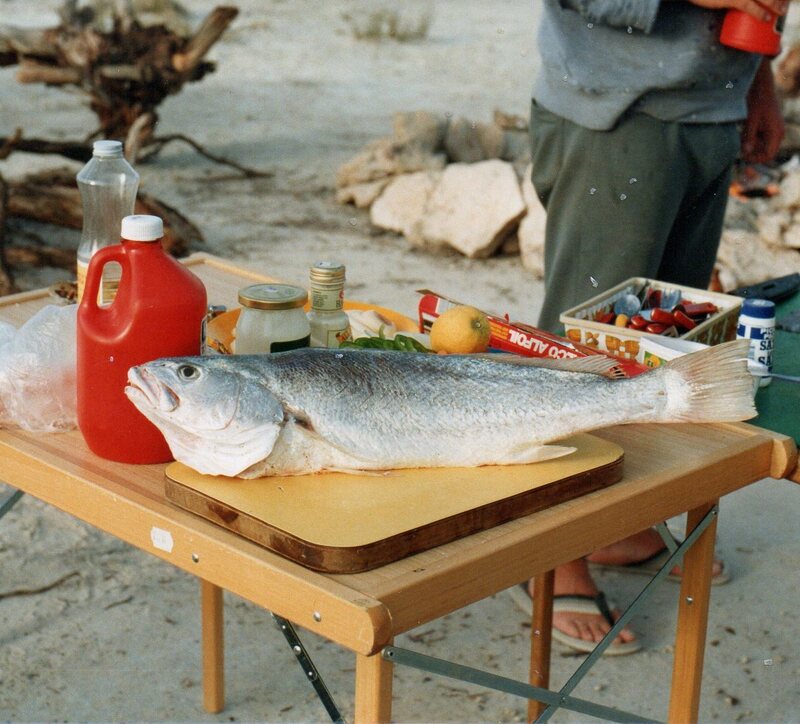 Huge salmon were caught off the beach and off rock ledges and if you were lucky mulloway. Smaller fish like tommies and garfish were caught and smoked and we’d go the Fowlers Bay jetty a few times and catch whiting, squid and crabs. 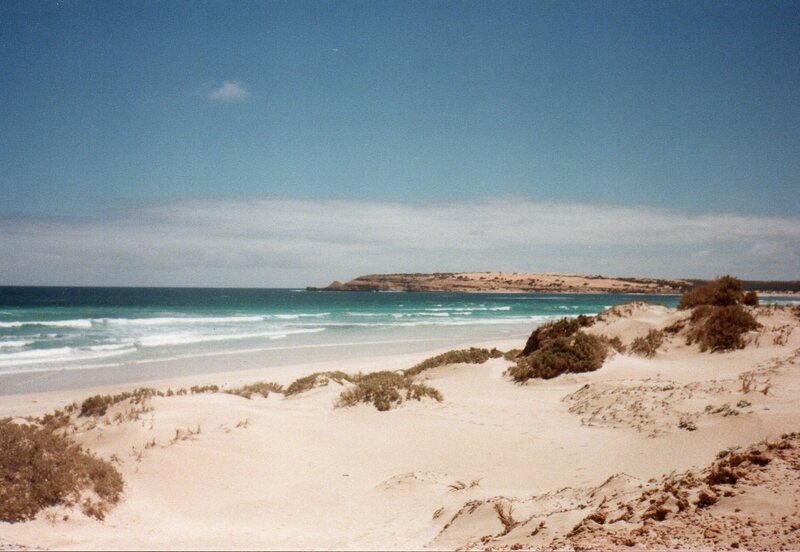 The scenery was amazing, I don’t think I’ve seen such giant and pristine sand dunes since then. Sparkling blue water, rugged and rocky cliffs overhanging the deep ocean and a colony of seals sunning on a private beach just some of the images etched in my mind forever. And when the fishing wasn’t plentiful we had the backup of some meat and vegies which were kept cold with the use of a caravan fridge and generator. Usually by the end of the holiday though, there were some dubious menus and the last day was horrendous. Eat whatever is left! There were some interesting combinations; salada biscuits with vegemite and smoked oysters from a can, camp pie and canned potato salad or “are those sausages looking a little green to you”? But we all made it back alive to tell the tales. We kept a log book of sorts while we were there to which everyone contributed a little note here and there every day. It would have weather observations, a fishing catch update and tally and usually something amusing would happen that just had to be written down, no one took themselves seriously for a minute. Everything taken in came out with us. No rubbish was left behind and then once home we were grateful for a hot shower, full bellies and a soft bed. Then all we had to do was wait a week or so for the photos to be developed to see if we’d captured it all.